Posted on January 28, 2015	by Rev. Joe Jagodensky, SDS. Three new buzz words put together to “wow” you into whatever program or purchased service is offered to you, usually when you’re older. We’ve all seen movies where, in the name of God, the body is mortified to the glory of the spirit as though there’s a division and constant struggle between the two. As often happens in theology, the thinking is great but the application very often fails. 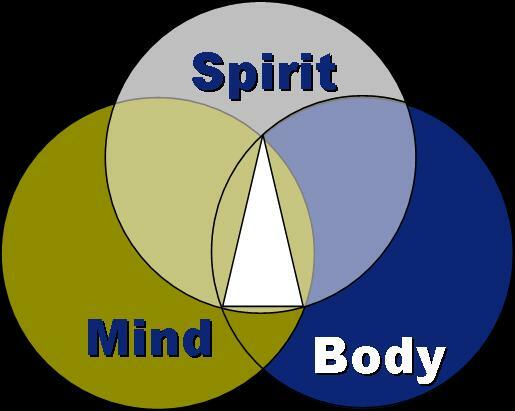 Creating a division between body and spirit is our first problem. The referee to all of this is the mind. The body may yell and we may yearn for the spirit but the mind is the middle piece that somehow unites the three. I don’t wish the mind to be in control because it never is, it’s too influenced by all kinds of stuff out there and has a difficult time processing it all. That’s where the body steps in to help inform the overwhelmed mind. That’s where the spirit haunts the mind until it is reckoned with. Save your money. There is no program or service that can unite three totally different pieces of life. Trying to combine them makes for a great looking ad campaign or a healthcare slogan but the work is done through our own personal prayer life, and it’s free. In youth we have a growing mind controlled by the body with little regard to the spirit. In later life we have a failing body and a history-ladened mind that is searching for fulfillment through the spirit. Who’s right? Well, I guess it depends what age you are. This entry was posted in Spirituality and tagged healthcare. Bookmark the permalink.